- Wholly Guacamole Classic 100 Cal Minis: Dippable, Squeezable Goodness! This is our classic guacamole in fun, 100 calorie, portable cups. This is an easy guacamole to love. It's simple guacamole goodness in the convenience of a travel cup. - Wholly Guacamole Spicy 100 Cal Minis: Spice Up Your Snack! Try a mini snack with a big kick. If you like spicy guacamole as much as we do, this is the best guacamole for you. - Wholly Guacamole Avocado Ranch 100 Cal Minis: Yee-Haw, Avocado Ranch! We took creamy avocado and added the spices of ranch that you love, and created the Wholly Guacamole Avocado Ranch Minis. These little cups are perfect for an afternoon snack or as a spread on your turkey sandwich. Your baby carrots will never be the same again. - Wholly Chunky Avocado 100 Cal Minis: Avocado On The Go! Pure, 100% Hass Avocado, now comes in easy to use snack packs! Everything you love about fresh avocados without all the fuss. Pack it in a lunch, eat it for a snack or use it as the perfect portion. Now matter how you serve it up, we know you’ll love it! Wholly Guacamole has made guacamole even easier to love. It's simple guacamole goodness in the convenience of a travel cup. Perfect for snacking, veggies, sandwiches, and more...what could be better? I know that my kids are going to love having these sent in the school lunches, and I'm sure that their friends are going to be a little bit jealous! This giveaway will end September 17th at Midnight EST. Disclaimer: The Being Frugal and Making it Work family received complimentary Wholly Guacamole Minis samples for the purpose of writing a review and hosting a giveaway. Regardless, I only recommend products or services I would use personally and/or believe will be a good fit for my readers. The views and opinions expressed on this blog are based purely by our own experiences. No monetary compensation was received. Results may vary. I've already tried the classic & spicy guacamole so I think I would most like to try the Wholly Salsa® Guacamole & Spicy Pico dip. There are so many recipes that I'd like to try but the recipe I would most like to try first is the Mexican Shrimp Cocktail. I would especially like to try the Wholly Salsa® Avocado, Black Bean and Roasted Corn dip! East and West Cheesecake which is really simple to make. I want to try the spicy guac minis 100 calories per pack. Im going to try and make the east and west cheesecake, it sounds so tasty. I would like to try the Wholly Chunky Avocado Dip. Thanks for the review and giveaway! I would love to try the Wholly Guacamole minis. They would be great for my and my daughter's lunches. We both LOVE guacamole! The chunky guacamole looks and sounds the best to me. I'd like to just eat it with a spoon. Haha!!! The cheesecake recipe would probably be a favorite in our home! Visit Wholly Guacamole & return to tell me in a blog comment, which Wholly product you would most like to try. The product that I would like to try from the Wholly Guacamole company is the red pepper mango salsa. I love chips & salsa so I'd like to try the pineapple salsa...and maybe the East & WEst Cheesecake for dessert! I would most like to try the wholly salsa. I've tried the wholly guacamole and while I love it, I think I'd like to try something different too. These would go great with my sandwiches I bring to work! Thread 4 shrimp close together on thin wooden skewer. Add oil, garlic and parsley; heat just until bubbling, then remove sauce from heat. Place skewered shrimp on a rack in a pan; brush generously with garlic sauce. Broil shrimp 4 inches from heat until they turn bright pink (about 4 minutes). Baste at least once with garlic sauce. Place 4 - 5 shrimp in tortillas, add shredded cabbage and Wholly Guacamole dip. Roll into cone and arrange on plate. The Pineapple Salsa sounds divine as I love fruit and would enjoy the mixture of sweet and spice in this fabulous Wholly Guac Combo! Yum! Love their Wholly Salsa® Avocado, Black Bean and Roasted Corn dip! I like the Wholly Guacamole® Classic 100 cal Minis because we can use up the smaller packages at one sitting. I want to try the Wholly Guacamole Classic 100 Calorie Mini Packs. This would be perfect for lunch and portion control. My pick is for the Wholly Chunky dip with only the avocados inside as that sounds like a pure wholesome dip or spread that can be paired with any salad or sandwich too! As for recipes to try, I like the Mexican Shrimp Cocktail as that seems like a perfect party appetizer pleaser for any occasion! The Pineapple Salsa would be a tasty and nutritious fruit and veggie dip and spread to try for chips and tacos too! The Mexican Shrimp Cocktail would definitely be a favorite dish in my home as my family enjoys seafood meals! Thanks! As for recipes to try, I like the Mexican Shrimp Cocktail as that seems i like shirmps . 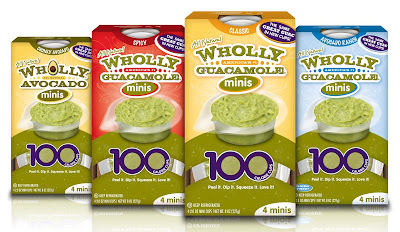 I really want to try the Wholly Guacamole 100 calorie minis in avocado ranch - perfect for dipping! I'd love to try the Wholly Salsa® Avocado Verde dip. Sounds very good. Classic dip. It does not have preservatives. I would to try Festive Taco Salad recipe made with Wholly guacamole and Wholly salsa. I would really like to try the Avocado, Black Bean and Roasted Corn dip or the Red pepper mango. Both of these sound really good. The Avocado ranch minis will be perfect in my lunch box. I would like to try the Avocado sundea recipe, I think the kids would get a kick out f it. I want to try the new Avocado Ranch. I've tried most/if not all of the other Wholly products. My favorites are Avocado Verde, Roasted Tomato, Mild Salsa, 100 calorie pack Classic guacamole, yummy! Everything is so fresh and so delicious. Oh my gosh. Mexican Shrimp Cocktail recipe looks amazingly delicious! I definitely want to try that soon. May have to get a few wholly recipes together for my upcoming vacation to visit my mother! The product I would most like to try is the Wholly Guacamole all natural roasted tomato salsa! Wow...the Pineapple Salsa sounds amazing! I have never had anything quite like it, so I really want to try it. The Avocado Cream Cheese Dip sounds perfect for a get together or family event. I would like to try the Wholly Salsa® dip, because it would give it an extra kick to dip chips in. I'd love try the Wholly Chunky Avocado dip. I love smearing guac on sandwiches, so much healthier than mayo!